The SonoScape S8 ultrasound is a shared-service system packed with some of the top ultrasound technologies available. As a portable ultrasound that functions like a full-sized, cart-based ultrasound, the SonoScape S8 supports real-time 4D, pediatric TEE, and two active probe ports with battery operation. In addition to cardiac, the SonoScape S8 ultrasound is suitable for OB/GYN, urology, vascular, MSK, breast imaging, abdominal, and small parts. The SonoScape S8 ultrasound is one of the best price/performance deals on the ultrasound market today. It impressed us with its image quality and has quickly become a top-seller and customer-loved product at Providian Medical. It creates a solution for many practices that can’t find a good full-body ultrasound for a reasonable cost. 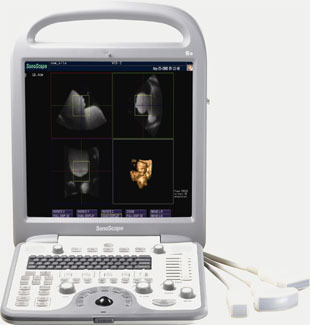 The SonoScape S8 truly is a breakthrough for versatility, size, price and performance in a portable ultrasound machine. We are particularly surprised to find how many different applications and transducers were available on the SonoScape S8. From Urology to Cardiology, it has the transducers and packages to perform nearly every ultrasound exam. Additionally, the 4D real-time 3D imaging has good image quality.